Sarah’s career interests in avian conservation began when she led public hikes for The Nature Conservancy in the Appalachian mountains of North Carolina. Since then she has pursued opportunities to conduct research with birds around the world. After earning her bachelor’s degree in Biology from the University of North Carolina at Chapel Hill, Sarah worked as a field assistant researching Lincoln Sparrows in southwestern Colorado, Red-backed Fairy Wrens in Queensland, Australia, and Common and Roseate Terns in Buzzard’s Bay, Massachusetts. She also developed her molecular biology skills as a laboratory technician at the University of North Carolina at Chapel Hill. She applied her experience to earn her master’s degree in biology from the University of North Texas with research focused on quantifying mercury in multiple bird species in north Texas and southern Chile. 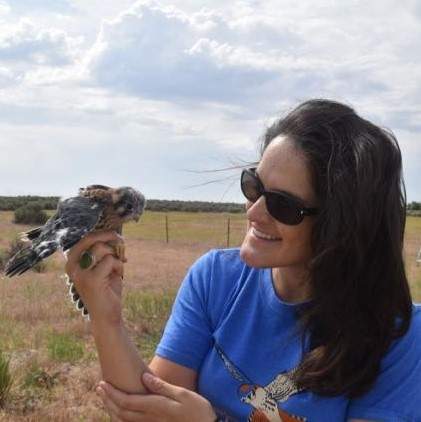 For her dissertation, she investigated questions of connectivity for two small, at-risk wild bird populations using genetic-based research methods to inform conservation management. Specifically, she investigated Greater Sage-grouse from Jackson Hole Wyoming and Short-eared Owls from the Galápagos Archipelago. Sarah has also worked to engage students of all ages in environmental education outreach. Building on her previous experience as an outdoor summer camp counselor, she brought interactive lessons ranging from stream ecology, backyard birds, and echolocation in bats to local public school students in Texas. Additionally, she has served as an advanced bird bander for over six years, training people of all ages in best methods of bird handling. Sarah is thrilled to work closely with partners of the American Kestrel Partnership in responding to the kestrel’s long-term declines.